Turkey's Foreign Minister Mevlüt Çavuşoğlu has condemned the shooting at a West Jerusalem synagogue which killed four Israelis on Tuesday. Çavuşoğlu's remarks came during a joint press conference with his Finnish counterpart, Erkki Sakari Tuomioja, after the two were engaged in bilateral and inter-delegation talks. "We condemn the attacks on holy places. 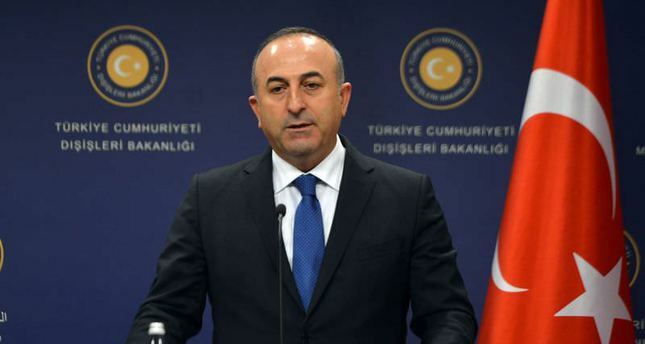 We had condemned Israel's attacks on Al-Aqsa Mosque as well," Çavuşoğlu said. "We are in a spiral right now, Israel's reckless attitude towards Gaza continues, however there are no excuses for the synagogue attack either." A total of four Israelis were killed and seven others injured in an attack by two Palestinians on a Jewish synagogue in West Jerusalem, with the two attackers gunned down by Israeli police in the immediate aftermath of the attack. Finland's Foreign Minister Tuomioja also condemned the attack and said the growing sense of frustration in the region will inevitably bring this kind of violence. "We should do everything that we can to prevent it and stop it, and the most important thing is to come back to the peace process, making the two-state solution possible," he said. Israeli Prime Minister Benjamin Netanyahu blamed Palestinian Authority President Mahmoud Abbas and Palestinian group Hamas for the deadly attack. Hamas responded by claiming that Israel's "continuous crimes against Palestinians" were the real reason for the attack. "The Jerusalem operation was a natural response to Israel's continuous crimes, including the [8-year] blockade on the Gaza Strip," Hamas' spokesman Sami Abu Zuhri said in a brief statement. Çavuşoğlu also highlighted the ongoing self-proclaimed Islamics State of Iraq and Al-Sham (ISIS) terror in Syria and explained that, beacuse the Free Syrian Army were the only element fighting against both ISIS and the Syrian regime, they are having a tough time. "The places where ISIS has forfeited because of the U.S.-led coalition airstrikes, is being filled by the Syrian regime," Çavuşoğlu said. "There is no difference between the Syrian regime and ISIS." "If the Free Syrian Army loses power, then this means ISIS and the Syrian regime will advance," Çavuşoğlu added. ISIS militants have captured several cities in Iraq, including the country's second-largest city Mosul, which was seized last June.